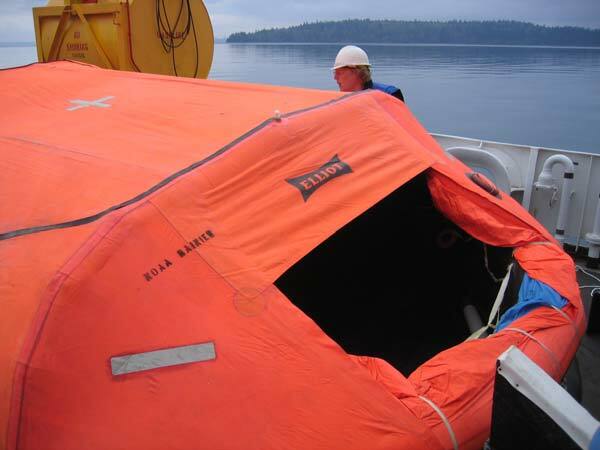 Chief Boatswain, Jim Kruger, demonstrates a life raft in a session aboard the RAINIER. Arrival evening and day one were spent mostly getting oriented with the ship, safety procedures, as well as a quick visit into Juneau before sailing out. Safety is the foremost concern in every scientific field of study. Since we’re on the ocean, there is a lot to be aware of and how to handle potentially disastrous situations. Therefore, we new arrivals were fitted and familiarized with a number of safety gear. First were the positive floatation devices. These just look like orange coats, but they’re heavily insulated and highly buoyant. NOAA Teacher at Sea, Matt Lawson, in a Positive Floatation Device and hard hat. They’re always worn as a precaution when boarding launch boats and in any other similar situations. In the unlikely event that you would fall into the water, you’d already be wearing a life jacket. We were also fitted with our immersion suits. These are whole body suits and are only worn in cases of emergencies, such as abandoning ship. There are emergency escape breathing devices (EEBD) hanging in convenient locations everywhere on the ship in case of fire. Hard hats were issued for wearing in work areas. A manual floatation device was also issued for wearing once you’re off on a launch, so long as you are in the cabin of the boat. Even these vests have a built in air canister, which can inflate the vest by pulling a cord located on the front. Last, but not least are the launch boats, which would be our first means of escape from a sinking ship. To back those up are the inflatable rafts, which open upon contact with the water. Jim Kruger, Chief Boatswain, briefed us about all these issues and supervised the fitting of our gear. 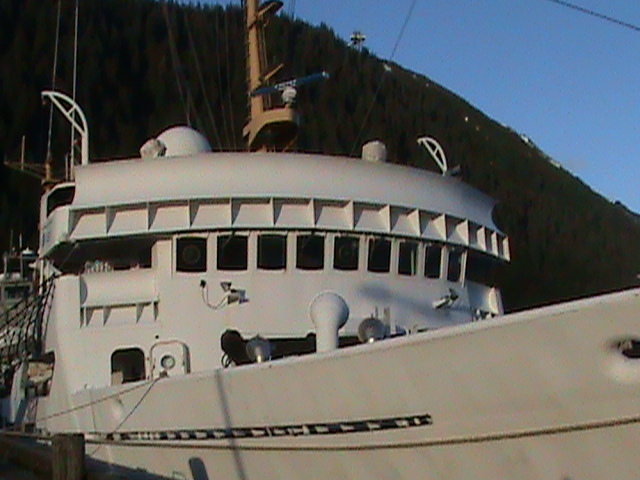 Stern – the very rear of the ship. Port side – as you’re facing the front, the left side. Starboard side – as you’re facing the front, the right side. Hydrography – the science of the measurement, description, and mapping of the sea bottom and tidal mudflats, as well as the positions of stationary objects at sea (both below and above the water’s surface), with special reference to navigation. Commanding Officer (CO) – the officer in charge of the ship. Executive Office (XO) – the officer second in charge of the ship. Chief Boatswain (pronounced “boe-sun”) – the primary person responsible for the boats, sails rigging, anchors, and cables. Electronics Technician (ET) – the primary person responsible for all telecommunications, computers, and other electronics on board the ship. Davit – a crane that projects over the side of stern of a ship and is used as a joist; a pair of davits is used to carry and launch/recover small boats such as a survey launch. Launch – a boat, typically less than 30 feet, used to conduct surveys. Hull – the frame or body of a ship, boat, or buoy. Latitude – the distance north or south of the equator of a point on the Earth’s surface; and imaginary line that runs east-west and ranges from 0-90 degrees north and 0-90 degrees south. Longitude – the distance east or west of the Prime Meridian of a point on the Earth’s surface; an imaginary line that runs north-south and ranges from 0-180 degrees east and 0-180 degrees west. Chart – a map designed to assist navigation by air or sea. NOAA – the National Oceanic and Atmospheric Administration. NOAA falls under the U.S. Department of Commerce and is responsible for prediction and research of weather and climate-related events, charting the sea and skies, and providing environmental stewardship of the nation’s coast and marine resources. Three of RAINIER’s launches hang in their davits. The captain of Alaska Airlines flight 59 announced our upcoming descent into Juneau. I looked out the window. The mountains poked their snow capped peaks through the clouds. It was my first ever glimpse of Alaska. As we descended, we momentarily disappeared into the white. Then things cleared up and an awe inspiring sight appeared. Juneau and the surrounding mountains were there. My gaping mouth and “Cheshire Cat” grin were seemingly permanent. I had no idea it would be this beautiful. Christy Shultz, (Junior Officer/JO) met Mark Friedman, (fellow Teacher At Sea/TAS) and me at the airport. We rode in a van with two other NOAA employees, Amy & Mike Riley back to where the RAINIER was docked. Upon arrival at the ship, Christy gave all the new arrivals the grand tour. Wow, what a nice ship! The personnel aboard keep this place looking spotless. RAINIER was built in 1967 and launched in 1968. Many adjustments have been made over time to meet changing needs and she has taken them all gracefully from what I can see. At this time, RAINIER is carrying 6 launch boats (metal hulled with canopies) and two skiffs (smaller, open top, with an outboard motor). 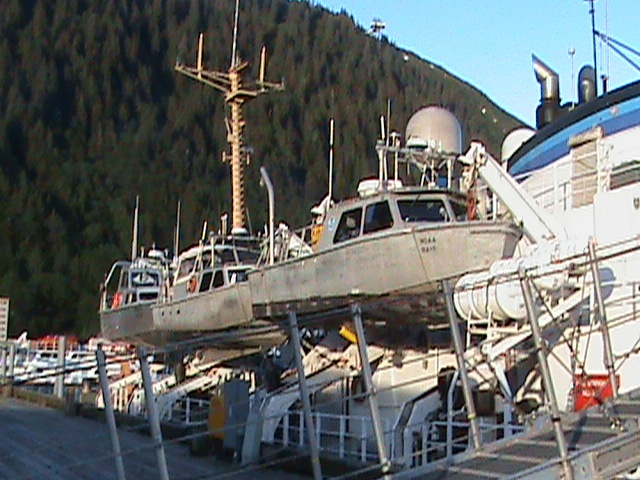 Each vessel, including RAINIER herself, is equipped with various forms of sonar technology for hydrographic charting. Hydrography is RAINIER’s main objective, specifically around the coastline of the Gulf of Alaska, and this is what we are to do for the next two weeks. We were introduced to a large number of rooms, and access to most of them is very casual. Basically, one should read labels on doors, and if it’s locked, don’t go in. Anyway, There are two main passageways: amid and athwart ship. The crew’s mess is in the very center of the ship. The decks are ordered alphabetically, A-F with A at the bottom and the Fly bridge on top. My quarters/stateroom, which I share with Able Bodied Seaman, Joe Normand, is in a small section of C Deck accessed by a ladder way. Ladder ways are sort of a hybrid between stairs and ladders. There are three staterooms in this section, each containing four bunks. Joe and I have the run of our stateroom for this leg of RAINIER’s ’08 journey. Near the front, of course, is the bridge, officers’ quarters, offices, (CO, XO, ET, and others) officers’ mess, and wardroom. Orientation and dinner aboard ship finished, newly acquainted friends, Matt, Adam, Fernando, & Mark conversed and talked about what our jobs and duties would be in the coming days. We were all very tired from traveling, but we knew we had to get our bodies aligned with the time zone, so we didn’t allow ourselves to sleep too early. Instead, we chose to watch movies in the wardroom. I’m guessing on other ships, this room is normally reserved for officers only, but we were told teachers and other visiting professionals usually commandeer it for themselves. Today was sailing day. There were more people and there was a definitely different buzz about the ship than yesterday as crew and officers alike went about the business of preparing for departure. We new arrivals worked to complete orientation: safety videos, drills and online tech safety training. At 3:45, (1545) the gang plank was pulled aboard, ropes were untied, and by 4pm, (1600) we were off. Most importantly . . . the food here is great! The cooks do a terrific job. They all have their specialties and they seem to love what they’re doing. Alaska experiences all four seasons and is not completely covered in ice and snow. Rainforest ecosystems can be found in Alaska. Desert ecosystems can be found in Alaska. 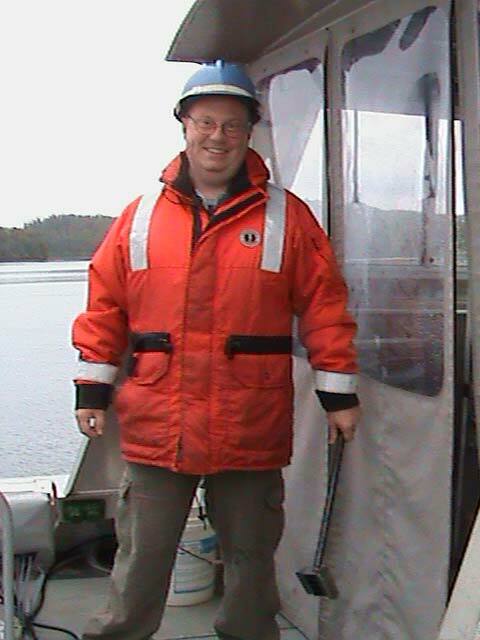 This entry was posted in 2008, Matt Lawson, NOAA Ocean Service, NOAA Teacher at Sea and tagged Alaska, Hydrographic survey, launch, multibeam sonar, nautical charts, noaa ship rainier, seafaring terms. Bookmark the permalink.